“In the spirit of fall weekends, Eastern Market is celebrating a homecoming of its own. Stanton Development and EastBanc, Inc. announced today that Eastern Market’s historic outdoor weekend flea market will return to its original home at The Plaza at the Hine School redevelopment project’s 700 Penn at Eastern Market. Saturday’s Capitol Hill Flea Market and Sunday’s The Flea Market at Eastern Market have signed three-year lease agreements and will once again move to the site of their long tenure this fall. After two years on the 300 block of 7th Street SE, the flea market will move back to the plaza this year, which it originally occupied before the Hine School demolition. The newly opened C Street and The Plaza were designed to ensure the markets had a long-term home. 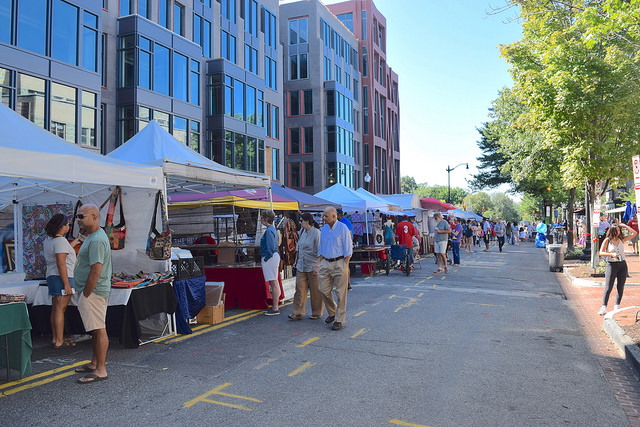 As construction at 700 Penn at Eastern Market progresses, the street vendors will occupy 50 flea market exhibit spaces along the stone-paved and tree-lined C Street plaza, which now connects 7th and 8th Streets SE. New amenities at the space include Dutch-style flush curbs, decorative iron tree pit grates, outlets in tree boxes for lighting, and discounted parking for vendors.